The Food and Drug Administration on Wednesday approved Mylan’s version in three strengths for ages 4 and up. The device contains two medicines, inhaled in a precise mixture. That complexity has stymied a couple of other companies developing generic versions of GlaxoSmithKline’s Advair Diskus inhaler, which costs about $400 a month. Generics generally are cheaper. Mylan didn’t immediately respond to queries about when its inhaler, called Wixela Inhub, will be available or what the price will be. http://www.parkallergy.com/wp-content/uploads/2018/11/PAC-Color-Logo-851x654-300x231.png 0 0 Michael Park http://www.parkallergy.com/wp-content/uploads/2018/11/PAC-Color-Logo-851x654-300x231.png Michael Park2019-01-08 08:02:472019-01-08 08:02:47Do you have a cough that won't go away? “Unfortunately, many people are still not getting flu shots due to broader misconceptions about the value of receiving a flu shot and concerns about the safety and efficacy of the vaccines,” Caitlin Oppenheimer, MPH, senior vice president of public health research at NORC, said in a news release. Last year’s flu season was particularly severe, with a record-breaking 900,000 hospitalizations and more than 80,000 deaths in the United States. Although most flu deaths were in adults older than 65, the flu also killed 180 children and teenagers. Many survey respondents did not know this. About two thirds (63%) incorrectly believed that last year’s season was about the same as usual, was less severe than usual, or they did not know. People who had already received their flu shot for this season were more aware of the severity of last year’s flu season; 43% of people who had already been vaccinated correctly identified last year’s season as being more severe than usual, compared to only 30% of people who do not plan to get vaccinated. Cite this article: Almost Half of Americans to Skip Flu Shot This Year – Medscape – Dec 06, 2018. Unlike other viral respiratory infections, such as the common cold, the flu can cause severe illness and life-threatening complications. In 2010 the Centers for Disease Control and Prevention reported that from 1976 to 2007, between 3,000 and 49,000 people died annually from flu-related complications, with the variation in the death toll related to the specific flu strain circulating in a particular year. The risk is greater for very young children, people age 65 and older and people with chronic medical conditions, such as asthma. Because both asthma and the flu are respiratory conditions, people with asthma may experience more frequent and severe asthma attacks if they get the flu. As a result, it is particularly important for people with asthma to take steps to minimize their risk of exposure. Influenza is a contagious disease that attacks the respiratory tract, including the nose, throat and lungs. The flu spreads when an infected person coughs or sneezes, spraying droplets into the air and onto people nearby. It can also be spread by touching droplets on another person or object and then touching your own mouth or nose before washing your hands. Infected people are contagious one day before developing symptoms and up to seven days after getting sick. Because many flu symptoms are similar to those of other respiratory infections, including the common cold, the only way to be sure it’s the flu is to see your doctor. There are tests that can determine if you have the flu as long as you are tested within the first two or three days after your symptoms begin. In general, if your respiratory symptoms are accompanied by sudden onset of body aches and fever and occur during flu season, suspect the flu. Peak flu season months in the U.S. are December, January and February; flu season can last from November through March. Fortunately for people living in most parts of the U.S., flu season doesn’t correspond to periods of peak pollen counts, which can trigger and aggravate asthma in those who are allergic. The best way to prevent the flu is to get vaccinated each fall. This is particularly important for those who have chronic respiratory conditions, such as asthma. The vaccine triggers the development of antibodies that fight the flu virus when the body is exposed to it. There are two types of flu vaccines: injection (the flu shot) and nasal spray. Those who have asthma or other chronic medical conditions should get the flu shot, which is an inactivated vaccine (meaning that it contains killed virus). The best time to get it is in October or November, as it typically takes about two weeks for sufficient antibodies to develop. The flu shot is approved for use in very young children, including those with chronic medical conditions, such as asthma. Allergists urge everyone who has asthma to get the flu vaccination as part of his or her routine care. Flu viruses change from year to year, so being vaccinated one year will not necessarily protect you from different flu viruses in subsequent years. The second type of flu vaccine, administered through a nasal spray, contains attenuated (weakened) live viruses. It is approved for use only by healthy people ages 5 to 49. Because it contains live viruses, the nasal-spray flu vaccine should not be used in people with asthma, as it can provoke or aggravate symptoms. 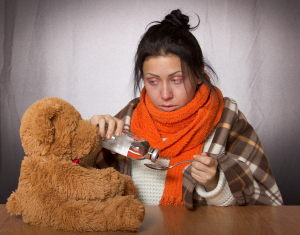 The best strategy for recovering from the flu is to rest, drink plenty of fluids and avoid using alcohol and tobacco. Over-the-counter medications can relieve the symptoms of the flu, but never give aspirin to children or teenagers who have symptoms of the flu — particularly fever — without consulting a doctor first. Aspirin use in children and teenagers with flu-like symptoms has been linked to Reye’s syndrome, a serious condition that causes swelling in the liver and brain. Your doctor also may prescribe an antiviral medication, such as Tamiflu (oseltamivir phosphate) or Relenza (zanamivir), to treat the flu, but these are effective only if started within the first two days of experiencing symptoms. Based on our research, this is the latest summary of currently available versions of injectable epinephrine in the United States as of December 2018. Prices reflect the LIST PRICE for a 2-pack and do not include coupons or other special discounts.